Can retail store designs be protected as trade dress or 3D marks? While survey evidence has an important role to play in trademark disputes, the rules vary depending on jurisdiction. This article examines how survey evidence in trademark disputes is treated by courts in five different jurisdictions. It is clear that survey evidence still has an important role to play in trademark cases, but that its use is more strictly controlled in some territories than others – in particular, the United Kingdom and Australia. Common themes emerge across jurisdiction – notably, that transparency in dealings is a laudable aim, with surveys being shared with opposing parties before trial. Cooperation between the parties is encouraged where possible, while courts are keen that parties avoid excessive costs in relation to gathering survey evidence. On May 7 2013, WTR announced the winners of its seventh Industry Awards at an exclusive ceremony at the stunning Belo Mansion in the heart of the Dallas Arts District. The awards are designed to recognise the vital work carried out by in-house trademark counsel, and identify the teams and individuals that are performing their functions to the highest possible standards. Over the following pages we speak to the winners and explain why they were judged to be leading examples of industry best practice. 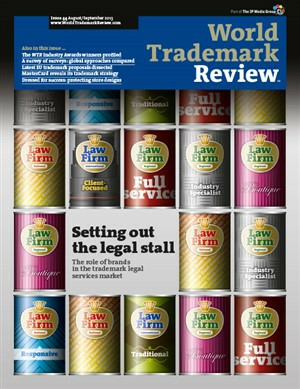 With external counsel under acute pressure to provide a wider range of services at more cost-effective price points, trademark law firms and practitioners are increasingly seeking to differentiate themselves on the market. Are brands the answer? Interflora: a victory against the use of trademarks as AdWords? The High Court of England and Wales has ruled in the long-running dispute between Interflora Inc and Marks & Spencer (M&S) over the latter’s use of the mark INTERFLORA as an AdWord. In the same week that the Internet Corporation for Assigned Names and Numbers (ICANN) published the first responses to the recent Governmental Advisory Committee (GAC) advice on the generic top-level domain (gTLD) programme, Deloitte revealed that 636 trademark holders and 119 agents have registered with the Trademark Clearinghouse. The US Supreme Court has decided to take on a case that could have wide-ranging implications for brand owners in the United States.